With office parties, family festivities and other holiday gatherings on the social calendar, it’s a good idea to plan your event outfits in advance. And whether it’s a low-key celebration or a sophisticated soiree, you’ll want a different look for every occasion. A simple way to elevate a basic ensemble or change up a little black dress is with accessories and makeup. The holidays and New Year’s Eve, especially, are the perfect time for glitz and glamour. Add some bling to your outfit with a statement necklace, such as this one from ASOS. Don’t be afraid to incorporate costume jewelry, bold shoes and embellished bags into your ensemble. Jewelled collars are big this season and an easy way to add sparkle to a plain shirt or dress. Similarly, statement necklaces and bibs are also great for mixing and matching with outfits. Try jewelry inspired by art deco or baroque — two of the hottest trends for winter. Look for geometric patterns and jewel tones in an art deco piece, and oversized, lavish black and gold details for baroque accessories. Accessories adorned with fringe, feathers or furs are another fantastic way to add unexpected texture to your party look. Channel the flapper era with a little fringe purse, add some drama with a feathered hair clip, or stay warm and chic in a faux fur wrap. Jewelled headbands and sparkly bobby pins add some festivity to hair, whether it’s left down or in an updo. Shine from head to toe with metallic footwear. Sandals by BCBG. For shoes, go embellished or vibrant if the rest of the outfit is casual. Something like an embroidered pump or a lace bootie would spice up a simple jeans and blouse outfit. Don’t forget to finish off your holiday party look with a bag. Go for clutches — they’ll streamline your silhouette without adding bulk and are easier to tote around when mingling. Metallic shoes and clutches are great additions to the wardrobe. Gold and silver go with almost any colour and adds lustre to neutral outfits. Make a black dress pop with a metallic belt and heels. And even if you’re already wearing metallic clothing, like a silver sequined dress, don’t be afraid to experiment with bold jewelry and accessories. Play around until you find a combination that takes the outfit up a notch. Bring out your inner rock star with this studded clutch from Aldo. Extend the glitter into your makeup look as well. Holiday parties are a great excuse to dig out that shimmery eyeshadow or daring lipstick from the back of your makeup bag. Try metallic or glitter eyeliner for a different look. But to give your eyes more emphasis, line them with your regular, dark liner after you apply the metallic. This way, the metallic colour will still be visible without losing the outline of your eye. If you don’t normally wear makeup but want to play up your eyes for parties, look to palettes to make choosing eye colours easier. They usually come with a highlighter, eyeshadow colour and liner shade. Black liner frames the eye, while the gold adds festive shimmer. For lips, red is a classic and particularly striking when combined with a neutral outfit. Balance the makeup so your lips and eyes don’t fight for attention. Keep your eye makeup simple if you’re going with bold lips, and pair dramatic smokey eyes with a natural lip colour. It’s also a good idea to use primer so your makeup stays put if you plan on being at an event for hours (such as New Year’s Eve). For fingertips, a trend that’s hot right now is the caviar manicure where tiny coloured beads cover the nails. Fun for a night out, they’ll have everyone flocking for a closer look. Whatever look you decide on, the best accessory is always confidence. Believe you’re looking fabulous and you’ll be shining even at an Ugly Christmas Sweater Party. It’s that time of year again — festive ornaments adorn every corner, cheery carols are in constant rotation and your email inbox is flooding with holiday party invitations. It may be tempting to rely on the usual ensembles, but I encourage you to take your party style up a notch. December events are perfect for eye-catching glamour and most stores are offering a variety of options in their holiday collections. The trick is to have one amazing statement piece and use it as inspiration to build the rest of your party look. Switch a skirt with sequined hot pants from French Connection to take an office look from day to night. Incorporate different textures to make for a more interesting outfit: velvet, silk, feathers, faux fur. Sequins are always huge for the holidays. Whether it’s in black, gold or another vivid hue, the shiny embellishment can be found on anything from fully sequined dresses to shoes. The idea with this trend is to not overdo it. One sequined item per outfit is enough; keep the rest of the look subtle. This shimmery sequined dress from ASOS just screams New Years Eve. Lace is another popular choice. Depending on the design, lace can be either demure or sultry, so take that into consideration if you’re wearing it to an office holiday party versus a gathering with close friends. For a fresher way to incorporate lace into your wardrobe, look for items in colours other than black or white. It’s unexpected and more festive. Accessories make for great statement pieces as well. An all-black ensemble with a pop of colour in the shoes or a bright, chunky necklace can be both understated and visually compelling. Patterned tights are also a fun way to liven up a simple party dress and can be found in a variety of designs like houndstooth or floral. Add some glitter to your outfit with a pair of jazzy bow heels from Aldo. As for hair, stylist and Suki’s salon manager James Valiant suggested updos. “One of the most common and easiest holiday updos is a French twist. A French twist can look beautiful if worn with a formal gown and it can also complement a less dressy outfit,” said Valiant. Another popular request is a modern bun, or chignon. For those wanting to wear their hair down instead, Valiant said to include lots of volume and movement — the biggest trend for the winter season. Whether it’s up or down, you can enhance your hairstyle further by adding sparkly barrettes or jewelled hair pins. 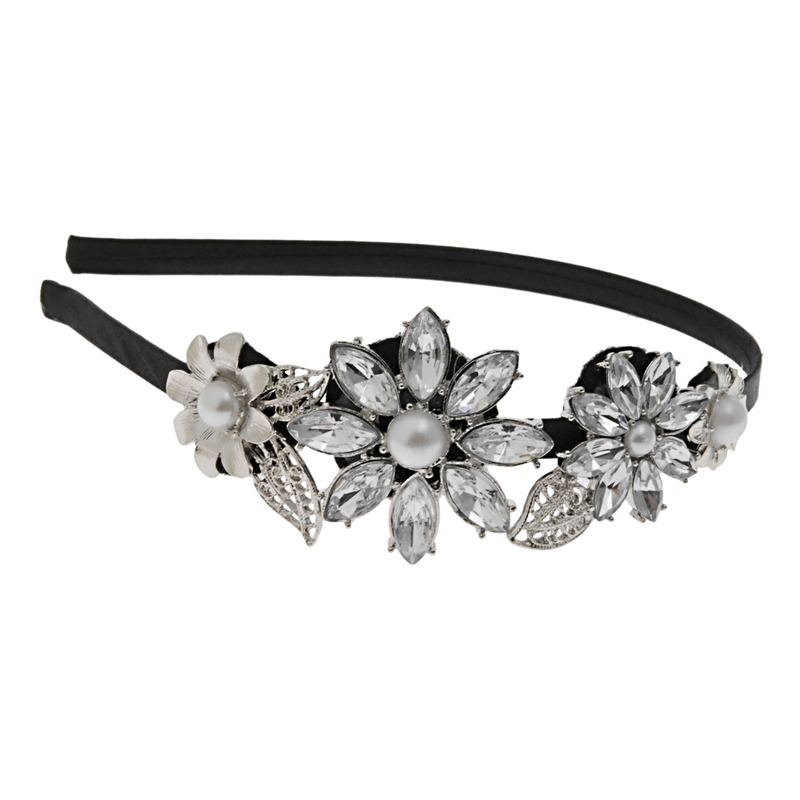 Jewel-encrusted hairbands are an easy way to add some glam to all hairstyles. Makeup is another aspect you can take to the next level from your usual party routine. With the increase of beauty salons specializing in lash applications and extensions, fake lashes are becoming more prevalent for everyday use and especially for special events. A different way to play up your eyes is to swap your regular liner with glitter liquid liner. A swipe of sparkle across your lids will have others doing a double take. The bold but classic red lipstick is a popular choice for parties as well. Those are just a few ideas for the ladies this holiday season. Sift through your closet and plan your outfits at least a day in advance. I’m a big believer that you don’t have to buy a new outfit for every party, but hit the shops if you’re feeling uninspired with what’s in your wardrobe. Take into account the dress code and theme, if provided (and disregard most of the above if it’s an ugly Christmas sweater party). Above all, feel comfortable and excited about your party look — it won’t be much fun if most of the night was spent adjusting your hemline or fretting over your lipstick!